Cox Automotive Fights Hunger 11 Years and Counting | Cox Automotive Inc.
During two weeks in June, Cox Automotive team members collected an astonishing 152,157 pounds of food as part of the annual Drive Away Hunger campaign that will provide over half a million meals for families in communities worldwide. Hunger affects people all over the United States. But food lack and insecurity are global problems, so Cox Automotive has responded in a global fashion. 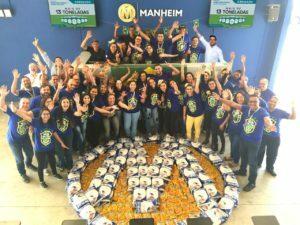 Manheim Brazil donated the largest amount of food—over 27,000 pounds. 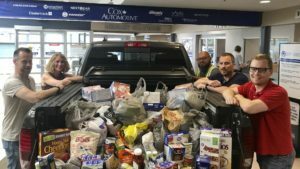 During two weeks in June, Cox Automotive team members collected an astonishing 152,157 pounds of food as part of the annual Drive Away Hunger campaign that will provide over half a million meals for families in communities worldwide. Since its launch in 2007, the Drive Away Hunger effort has grown with the company, expanding to Canada, Australia, the United Kingdom, Portugal, Brazil, and around the globe. “When we were considering all of the issues that we could support, food is such a primary, essential need,” says Michele Blondheim, Executive Director of Corporate Responsibility for Cox Enterprises. Cox Automotive team members focused on the most-needed items and high-quality, nutritious food. Cox Automotive team members focused on the most-needed items like canned meat and fish; low-sodium, no-sugar-added varieties of whole-grain dry pasta, fruit juices and soups; and healthy snacks. The emphasis was on high-quality, nutritious food. While some employees shopped for food individually, other departments pooled their funds to shop in bulk at warehouse stores. Team members filled donation bins to overflowing with food earmarked for local charities. But according to Blondheim, the Drive Away Hunger campaign didn’t end with food donations. “Team members then went to local food banks, helped sort the food, and packed boxes to help distribute the food to organizations supported by the food bank,” she explained. Each Cox Automotive location leveraged existing charitable relationships, or tapped new partners when necessary, so that the campaign would have the biggest hometown impact. From pantries and soup kitchens to shelters and other community-based agencies, this global network ensured that food collected stayed local. To pull off such a momentous achievement, the company cultivated an extended team of employees from each business, brand, location, and country to help coordinate this effort and to motivate their colleagues to participate. “It takes a significant amount of collaboration and activation at the local level. While our Community Relations department provides a comprehensive communications plan and digital assets—a toolkit of sorts—we just couldn’t do it without our amazing extended team,” Blondheim explains. Manheim Atlanta won the annual CANstruction—a competition showcasing colossal structures built out of the donated canned food. 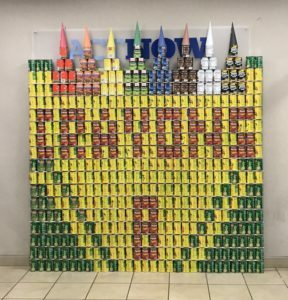 The Drive Away Hunger campaign culminated with CANstruction—a competition showcasing colossal structures built out of the donated canned food. Team members strategized and plotted out their designs, inspiring camaraderie and raising greater awareness of the fight to end hunger. The CANstruction video presentation vote-off garnered more than 10,000 views. Manheim Atlanta beat out other Cox Automotive business units to win the coveted Golden Can award for their crayon-inspired structure. Cox Automotive facilitates and promotes charitable activities year-round. Some team members are already regular volunteers at food-based organizations, performing meal prep and deliveries to at-risk communities, as disaster response, or serving on boards at food banks in their cities and towns. But the Drive For Hunger campaign casts a larger spotlight on world hunger relief and the impact of making a collective difference.